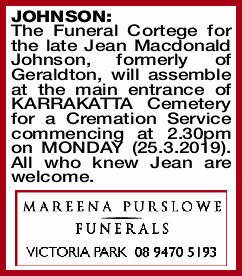 The Funeral Cortege for the late Jean Macdonald Johnson, formerly of Geraldton, will assemble at the main entrance of KARRAKATTA Cemetery for a Cremation Service commencing at 2.30pm on MONDAY (25.3.2019). All who knew Jean are welcome. 13.09.1932 - 19.03.2019 Passed away peacefully. Dearly loved Wife of Cardell (dec). 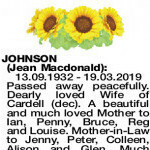 A beautiful and much loved Mother to Ian, Penny, Bruce, Reg and Louise. 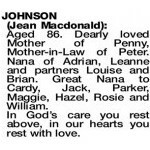 Mother-in-Law to Jenny, Peter, Colleen, Alison and Glen. 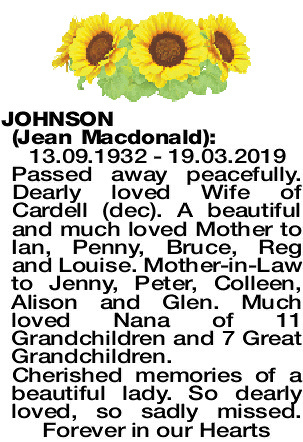 Much loved Nana of 11 Grandchildren and 7 Great Grandchildren. 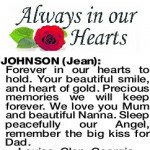 JOHNSON JEAN Forever in our hearts to hold. Your beautiful smile, and heart of gold. Precious memories we will keep forever. 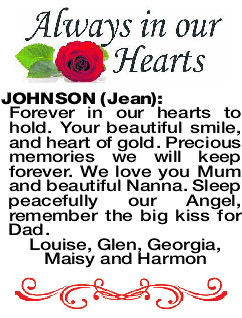 We love you Mum and beautiful Nanna. Sleep peacefully our Angel, remember the big kiss for Dad. 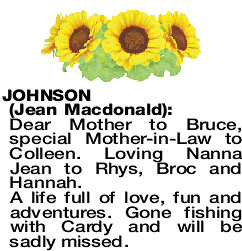 Dear Mother to Bruce, special Mother-in-Law to Colleen. 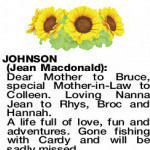 Loving Nanna Jean to Rhys, Broc and Hannah. A life full of love, fun and adventures. Gone fishing with Cardy and will be sadly missed. Aged 86. Dearly loved Mother of Penny, Mother-in-Law of Peter. Nana of Adrian, Leanne and partners Louise and Brian. Great Nana to Cardy, Jack, Parker, Maggie, Hazel, Rosie and William. In God's care you rest above, in our hearts you rest with love. 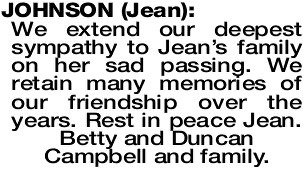 We extend our deepest sympathy to Jean's family on her sad passing. We retain many memories of our friendship over the years. 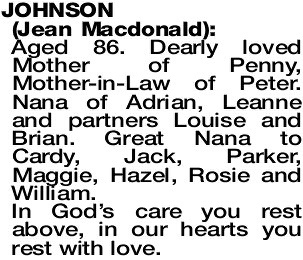 Rest in peace Jean. Betty and Duncan Campbell and family.